The World's Fair pavilion was the Fair's major indoor assembly hall. The light latticework structure was a geodesic dome composed of 1,250 interconnected pieces of aluminum tubing. Weatherproof vinyl lined the inside. The dome's design eliminated the need for internal supports, and thus offered unobstructed views of the stage from all 2,100 seats. When the eminent British statesman died in 1964, the World's Fair pavilion, which was little used during the first season, was used to display mementos from Churchill's life and political career. 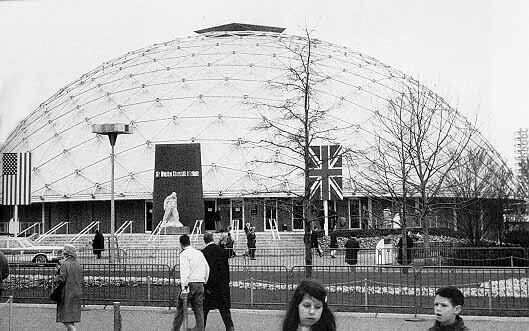 The World's Fair pavilion housed the Winston Churchill Tribute during the 1965 season.